2) And it includes what is perhaps the most memorable use of synaesthesia in any work of fiction. In regard to the former, works like Johnny Mnemonic and Neuromancer would not find inspiration without the narrative’s “Man vs. Corporation” conflict. On the latter idea, synaesthesia – a rare neurological condition – is represented by having words being stretched, skewed and crushed within the pages to indicate the senses being described. It is the 25th century, and human beings are able to “jaunt”. This commonplace ability allows anyone with enough willpower to teleport themselves to any point on Earth. The power comes at a price; social and economic repercussions from jaunting result in a war between the Inner Planets and Outer Satellites. Gully Foyle, a mechanic for Presteign Enterprises, is the only survivor on his drifting, wrecked spaceship after an enemy attack. Another space vessel, the Vorga, ignores his distress flares and zooms by. Enraged, Gully swears revenge. He endures 170 days alone in deep space before finding refuge on the Sargasso Asteroid and returning to Earth to hunt down the crew and owners of the Vorga. What follows is an epic tale, featuring a deadly civil war, a cast of misfits, and a man hell-bent on vengeance with a secret that could alter history forever. The Stars My Destination is still relevant today for Alfred Bester’s innovative use of the English language, most notably the use of contrasting fonts to suggest synaesthesia. The language itself progresses according to the maturing protagonist, who transforms from a dumb brute to a sophisticated, but ultimately flawed, gentleman. Foyle effectively splits in two: becoming a parody, and triumphant celebration, of human evolution. He starts as an animal that transcends his primitive nature and becomes larger than life through jaunting further than most. William Blake’s poem The Tyger adds more to the present symbolism. 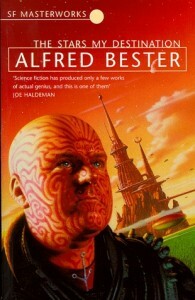 Foyle’s face is tattooed by an asteroid cult near the start of the novel. The design appears to be tribal markings that glow red when Foyle’s anger kicks in, giving him the appearance of a tiger. As Gully Foyle he is the tiger, but when he transforms into Geoffrey Fourmyle, he becomes the lamb, thus cementing Blake’s “fearful symmetry”. Pros: To add to the aforementioned symbolism and novelty, The Stars My Destination is a fun science-fiction novel. Its moderate length of 232 pages will mean a short, yet engaging read. The characters are memorable, the twists and turns make for a good page turner, and the balance between action sequences and dialogue is sensible enough for those who aren’t fond of science-fiction. Cons: Readers familiar with Alexandre Dumas will distinguish the number of similarities between his masterpiece The Count of Monte Cristo and The Stars My Destination. Bester was directly inspired by Dumas’ tale of a man who is wrongly imprisoned, escapes with another inmate, and sets about killing those he deems guilty. Inspiration can breed creativity; nevertheless, some mature readers might consider The Stars My Destination to be a juvenile high school project in comparison to The Count of Monte Cristo.